The Bella Petite Magazine Model search is the only internationally recognized magazine model search produced by Bella Petite Publishing, LLC. Throughout this year you will be seeing promotional editorials, interviews, and news featuring the winning cover models submissions. Participate in our positive message of female empowerment that shows you a new fashion forward ideology one which all women can appreciate. We offer you a refreshing look that celebrates women no matter our age, height, or ethnicity. Our magazine covers positively show you the old industry standards don’t apply to Bella Petite Magazine! Be sure to grab and share your favorite covers below on Facebook, Twitter, Instagram… everywhere! Our magazine has given the fashion, beauty and modeling industry standards a facelift. 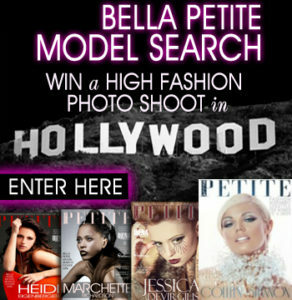 Join the Bella Petite fashion initiative today and be part of the largest worldwide global fashion and model movement. Bella Petite Magazine is Fashion, Entertainment, and LifeStyle for Women. Petite is fit, curvy and plus-sized. Free to join us!